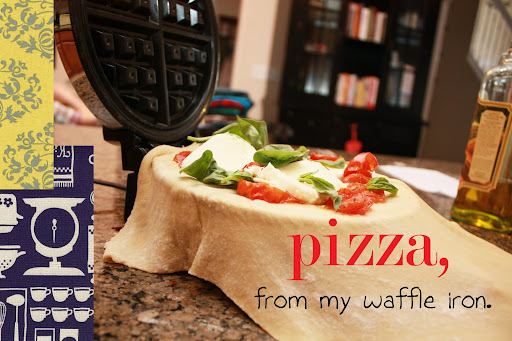 little momma and company: pizza: WAFFLEIZED. I love my waffle iron. 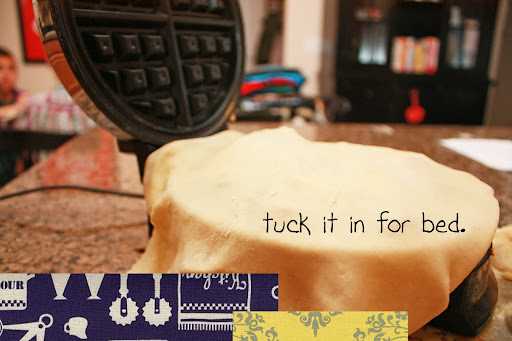 I can whip out a pretty mean batch of waffles on a lazy Saturday morning. But, I love to come up with new ideas for tools I have in my kitchen. I love to multi task! Come on you lazy utensils, pull your weight around here! 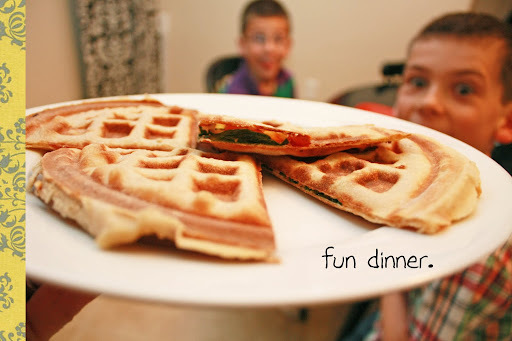 So, I've figured out that a waffle iron isn't just for making waffles. I've used it to make dessert with pound cake, strawberries, and Nutella. Toasted tortillas. Made paninis. So, who's to say that you can't use it to make pizza? Believe me when I say that this is delicious. It really is. But, there are a few tricks. Ready? 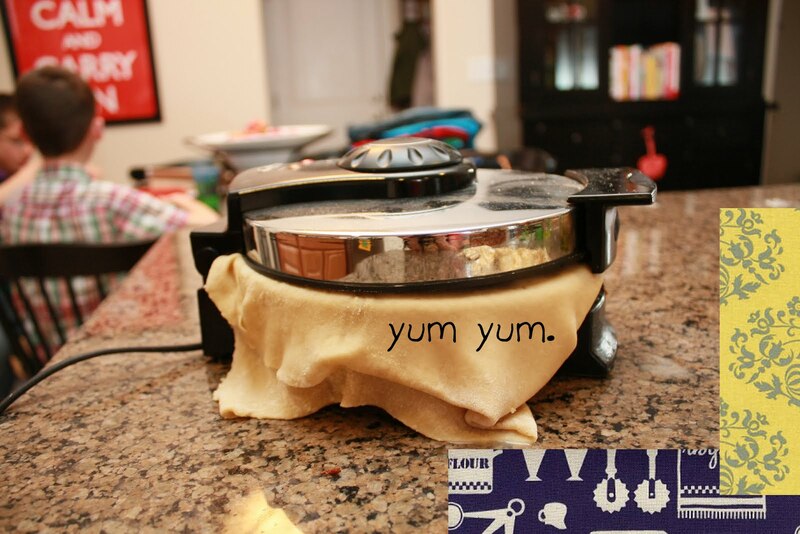 First: Make sure your dough is rolled very, very thin. almost see through. Second: If you are using toppings that might get kind of juicy, put your iron on top of a lipped baking sheet to catch any drippings. Third: Use a bit of non stick spray. Just for insurance, to make sure everything slips out of there. Nobody likes picking out between the waffle iron ridges. Nobody! I just rolled a long rectangle of dough, and then rolled it over onto itself after I had tucked my toppings inside. See? Baking time would vary, I went by the color of the crust. I took it out when it was golden brown and crunchy. Trim the sides as you would a pie crust with a knife. They are easily removed, the edges kind of seal up with the heat and keep all of the toppings inside. You kids faces in the background say it all! What a cool idea! This is the first time Im sad that my waffle iron is circus shapes! What a cute idea! Your pizza looks good and I am sure it's delicious, too! That is the coolest idea. Now if only I still had a waffle maker. May have to go get one now. I do miss my old one. Oh, my girls would love this!! Thank you for sharing!! Oh my goodness! You crazy-good-idea GIRL! I'm gonna have to try this. It would definitely take our calzones up a notch. Your boys are so lucky. SUCH an awesome idea! You go!! K-I'm pretty sure you're the most creative person EVER! I read your blog and just think "Wow! I wish I could be as creative as her!" This was EASY and delicous. One waffle round was the perfect size for me, my kids consumed about 3/4 of it. The cut easy, store easy... but like I said before... put that iron on a lipped baking sheet! It can get messy if you use a juicy ingredient! New Zealand on a stick. the day my sweater became my best friend. busy bees, made with honey. Adventure bound, on a Monday. doing the salsa, with a cinnamon side step. i wish i was a cheerleader. snowy sunday and burrito babies.